Last weekend I joined a panel of smart city people at the South African Book Fair, to talk about the notion of a post-apartheid Johannesburg – under the title ‘Future Perfect’. The other members of the panel were David Everatt, former head of the powerhouse Gauteng City-Region Observatory (GCRO), and about to take up the Chair of something equally important at Wits (but I forgot to write down the full title; so I will update as I get that info); Zayd Ebrahim from the City of Johannesburg, who is Deputy Director of Strategy and Research in the Executive Mayor’s office; and Rashid Sedat, head of the Gauteng Planning Commission. The panel was chaired by the brilliant (academic, author, planner, etc) Philip Harrison, who is also one of the editors of Changing Space. 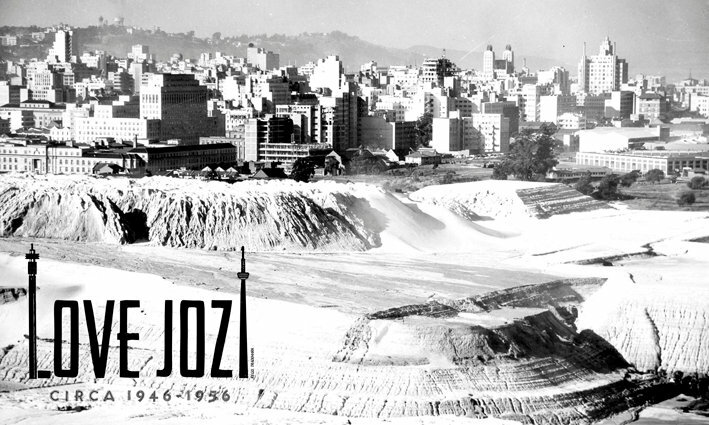 Changing City: Johannesburg After Apartheid (Wits University Press). During the hour or so that we spoke, I took frantic notes (mostly because I learned, as the session was about to start, that rather than being ‘in conversation’, we were each expected to present a 10-minute section! ), and thought I would share some of my thoughts, and random notes – for those who weren’t able to attend, but who are interested in all things Joburg. [Please note, this is not a summary or transcription of the panel; just ‘stuff I thought was interesting’]. 1. Data, maps, knowledge = power. The GCRO produces amazing research and data, including a ‘Map of the Month’. For July (the August one isn’t up yet), it visualised service delivery protests – something my colleagues at Africa Check have also been looking into (quantifying protests in general). It feels like it’s increasingly important to use data to drill down below the rhetoric – positive and negative – about the state of this city, the province, and the country. Projects like this empower all of us, with free, good quality information. • If I can predict your income by the colour of your skin, race matters. • Unemployment is spatially distributed away from where the jobs are [what this means, if you can imagine a map of Joburg, is that the further away you live from where economic opportunities are, the higher the unemployment. This is the double-edged sword (my phrase not his) many of us forget: most people can’t afford to live close to where the jobs are. And, because of poor transport infrastructure and/or the high cost of transport, the further away you are from work, the less likely you are to be able to ‘afford’ to have a job]. • White areas (or formerly white areas) are where we see the greatest lack of social capital [this was a significant insight; if you want to see where there is a lack of community, trust, neighbourliness, etc… it’s the white suburbs]. • [my own interpretation here] Inversely, crime affects these [white] suburbs less than poor (formerly black) areas. David pointed out that crime has been ‘exported’ to poorer areas. Throughout his presentation, David used fantastic visual representations of data – and then pointed out (and illustrated) how ‘big data’ is useful but can be misleading. He used the 2014 elections to illustrate this point, showing the complexities of the shift between political parties in a number of regions of Johannesburg – areas that should have been ANC strongholds showing a surprising diversity of not only EFF but also DA voters coming through. In DA wards there were EFF votes. Etc. This three-way struggle made him optimistic, because it seemed to represent the opposite of a static or single-party municipality. I share this sentiment because, while I don’t actually have a particular party affiliation, I do think that when complacency sets in, it leads to a very dangerous attrition, even wastefulness. An audience member expressed concern about Johannesburg’s casual appropriation of Tshwane (‘we don’t want to be annexed, thank you very much’) – but Rashid Sedat’s presentation, while not actually proposing any sort of actual Anschluss, did emphasise the urgency and importance of understanding and integrating regional development beyond ward, and municipal, boundaries. ‘We can’t think about the future of Johannesburg in isolation from all its neighbours,’ he said. These ‘neighbours’, of course, include not only Tshwane but Ekurhuleni, perhaps even Midvaal (or maybe I should say Sedibeng?). In his talk, Rashid gave a very practical example of this disconnect: how each city region, on its own (following Joburg, natch), had been developing new public transport systems like the BRT – but that, because they had not been developed in conversation with each other, the different systems used different buses, had platforms of different heights… This, he explained, made it more challenging to effectively link them together. He added that, while municipalities functioned independently, the residents of those cities often worked and traded across municipal spaces – so we all, in one way or another, have a real vested interest in developing a common agenda. Thinking in ‘city pockets’, he said, would ultimately inhibit us from effectively addressing spatial problems. ‘If we can’t replicate the Corridors of Freedom [Joburg’s progressive public transport strategy] in other parts [of the province], then it will fail,’ he said. Reading and writing history is a constant and important reminder that history repeats itself – for example, Joburg always was, and is, an immigrant city. A century ago it was Jews, or Italians, or Indians. Today it’s Chinese, Somalian, Zimbabwean… The only thing that’s changed is the specific culture or language, but not the overriding concept: people come to Joburg because this is a city of economic opportunity. The other thing that history teaches me, is that 21 years is not a helluva long time to fix things. We still have a lot of hard work ahead of us, if we’re going to make things right.